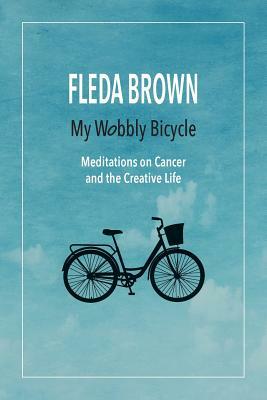 In this book full of pain and joy and raw honesty, Fleda Brown, poet and former poet laureate of Delaware, gives us a real-time account of her cancer diagnosis, chemo and radiation, from the doctor's phone call to the one-year, all-clear pronouncement. Now everything's shifted. We pretend there's some solidity, some predictability. But being alive is more like riding a bicycle, balancing on two thin tires. Eventually we'll fall one way or the other, but for the moment, we're upright. It's exciting, sometimes frightening. Brown's week to week accounts lead to the realization that one needs to face a wall-sometimes the wall of possible death-to see clearly. With great generosity, she allows the reader to come along through the darkness and the light. Brown turns her considerable intelligence to examine art's persistence and contingency. So perfectly tempered are the apprehensions of metaphor, so cunning are the felicities of form. . . we're tempted to think it's not art at all. Except for the radiance, which only art, and a generous mind, can make. Fleda Brown has published nine previous collections of poems. She's gathered a large selection of those poems for her new book, due out in 2017, called The Woods Are On Fire: New & Selected Poems, from the University of Nebraska Press. Her work has twice appeared in The Best American Poetry and has won a Pushcart Prize, the Felix Pollak Prize, the Philip Levine Prize, and the Great Lakes Colleges New Writer's Award, and has twice been a finalist for the National Poetry Series. Her collection of essays, with Vermont Poet Laureate Sydney Lea, Growing Old in Poetry: Two Poets, Two Lives, came out in 2013 from Autumn House Books. Her memoir, Driving With Dvorak, was published in 2010 by the University of Nebraska Press. Her poems have been used as texts for several prizewinning musical compositions performed at Eastman School of Music, Yale University, and by the Pittsburgh New Music Ensemble. She has won the New Letters and the Ohio State Univ/The Journal awards for creative nonfiction. She is professor emerita at the University of Delaware, where she taught for 27 years and directed the Poets in the Schools program. She was poet laureate of Delaware from 2001-07. She now lives with her husband, Jerry Beasley, in Traverse City, Michigan, not far from their cottage on Intermediate Lake. She is on the faculty of the Rainier Writing Workshop, a low-residency Master of Fine Arts program in Tacoma, Washington.